However, on Sunday, August 25, I stopped in at the outlet store in Kitttery, ME, which was full of smart-looking shoppers. I looked in all the usual places for the women's sizes racks. When I was unable to find any, I asked a clerk about where the women's sizes were located. The clerk answered, "We don't have those anymore. J.Jill took them away." To which I responded, "oh, I see. Like I'm about to take my business away?" At which point, a second clerk said, "You can shop on-line." I assure you, every other customer in that store was made aware of my dissatisfaction. I went into the store, ready to spend a significant amount of money, and left unhappy and treated unfairly. This is not okay. Not even a little, is it okay. If you offer women's sizes, as J.Jill does, you must offer them in your stores, as well. Not just the outlets, but in the stores in the malls. Otherwise, the message you are sending is that money from your fat customers is unacceptable, that fat people in your stores are unacceptable and that fat customers are not worthy of the same service and quality that your petite and misses-sized people are afforded. By any standard, this constitutes horrible business practice. Not only have you treated your women's-sized customers unfairly, J.Jill is practicing size-discrimination. J.Jill is alienating previously loyal, regular customers. How can that be a sustainable business model? 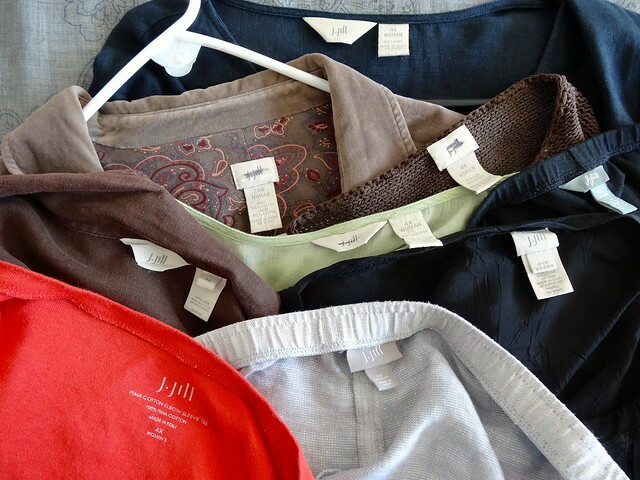 J.Jill had the opportunity to shine as a store that offered beautiful, well-made clothing in extended sizes in an industry that is unbelievably size-biased, and instead, J.Jill has alienated customers. What a shame! All people prefer the chance to try on clothing before purchasing it and appreciate being able to return items to a store. All people want immediate access to clothing (because we need to clothe ourselves - it's not a frivolous desire, it's an actual need), and all people deserve to be treated with dignity and kindness. Shopping on-line meets none of these needs. Over the twelve years that I been a loyal and regular customer to J.Jill, I have come to associate the brand with diversity. No longer is that the case. I'm not embarrassed or ashamed to be a fat person. I am embarrassed and ashamed that there are companies out there, such as J.Jill, who engage is discriminatory business practices. I have told all my twitter and Facebook followers about my experience, and I plan to blog about this as well. (I may just post this letter). Also, I thought you should know - I have a daughter who wears misses sizes. She won't be shopping at JJill, either, because she doesn't believe in J.Jill's discriminatory, size-shaming policies. I will be sharing this post on my networks, words fail me but this is not acceptable...at all. As you stated in your post, most people like to try clothes on before we buy them. It is very weak to tell a customer they can buy them online, that sends a very clear message and it is a hateful and discriminatory message. I always liked J.Jill... And am saddened that I will now not shop there due to this new policy of theirs... Sigh... When will companies realize that "plus" size women want real clothes and are willing to pay for them but not to hide in the corners or on-line! Thanks for letting us know about this, Amy! So sorry for your experience Amy but Bravo for not just sitting at home and stewing about it like I would have done. Your letter is articulate and so very well addresses your valid points. Let's just hope J Jill responds to you and your voice is heard in their corporate office. I am a size 16 and my son is a very thin, lanky, tall teen. We both have the same problem. We can purchase clothes online, but never in a store (for my son, it's just pants that he cannot buy in store). I usually don't make a big deal of it in the store, but I have written to the stores we shop. All I ever get is, "thank you for your input. We will take it under consideration." Amy, thank you for sending this letter and for publicizing it on your blog! You've inspired me to continue to write those letters and emails!